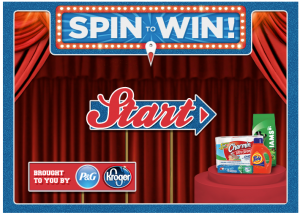 Home > Kroger Ad > Kroger: Spin & Win Intant Savings Game! Kroger: Spin & Win Intant Savings Game! For those of you who love to shop at Kroger or any of their affiliated stores, there is a Instant Win game you don’t want to miss! Kroger is giving away 45,000 coupons for $1-$4 off your order! To play, choose 4 P&G coupons to download to your store card and then click “Spin to Win”. Play each day through September 10th for the best winnings. When you are choosing eCoupons to load, keep in mind that electronic coupons don’t double & you can’t use them with a paper coupon.